I read my first Jojo Moyes book back in January and it blew me away. Me Before You is easily my best read of 2012 so far so when I heard that Moyes was releasing another book I couldn’t wait to dive into her writing world again so imagine my joy when I received an early review copy, needless to say it didn’t sit on the side awaiting my attention! The cover of this book is a similar style to her previous book and I love both of the covers they are definitely something that would catch my eye in the book shop. The first part of the book made for quite a compelling read for me we meet Sophie who is living in France in 1916 but their little village has just been overtaken by the Germans and without her husband Edouard around Sophie is forced to prepare food for the Germans in Le Coq Rouge much to her dislike. Edouard is away at war and Sophie has not had any correspondence from her husband for sometime so when the Kommandant shows a soft spot for her and a great interest in the painting of Sophie that her husband painted of her that hangs on the wall so she wonders if she can use him to try and attempt to get her husband out of danger. The second part of the book is when we meet our other heroine Liv this time we have jumped to 2006 and we see a reappearance of the painting of Sophie. The painting now belongs to Liv and was a gift from her husband David who has passed away. Liv is heartbroken and struggling financially then to top it all off she now has a court case over her head when it arises that the painting may have been illegally looted and so Liv stands to lose yet another thing close to her heart. I fell quickly into the storyline from the start of this book. It is easy to warm to each of the characters especially Sophie whose emotions shine through in this book. It is apparent early on that she would do anything to try and get her husband home but you cannot predict the lengths she would be willing to go through to make that happen. She seems like such a strong and feisty character when we first meet her not taking the Germans actions and requests lying down but as the story moves along and she interacts more with the Kommandant we start to see a softer more vulnerable side to her which only makes us warm to her the more. Unfortunately I didn’t enjoy the second part of the book as much as the first I felt like this part was a little to drawn out and at times my interest started to waver that is until we have small snippets of Sophie creep up again. I didn’t warm to Liv as much as Sophie but we all usually favour a character in a book and for this book it has to be Sophie who is my favourite heroine. Although I enjoyed this book and it is a very touching and interesting storyline, I can safely say my tissues are still in place! This is yet another beautifully written compelling read from Jojo Moyes and after reading The Girl You Left behind I am still a firm fan but this has not knocked Me Before You off the top spot. Thanks for linking this in to Books You loved. Hope you are having a super week. 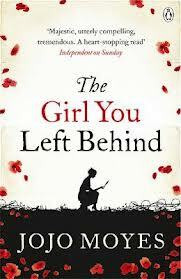 I like reading books set during the war I also like JoJo Moyles . I haven't read Me Before You but I loved Ship of Brides and The Horse Dancer which I didn't think I would like as it had horses in it but it really surprised me. I still have yet to read a book that will blow me away as much as Me Before You has done...I keep changing my mind as to whether I'd love Jojo Moyes to write a sequel to Me Before You.